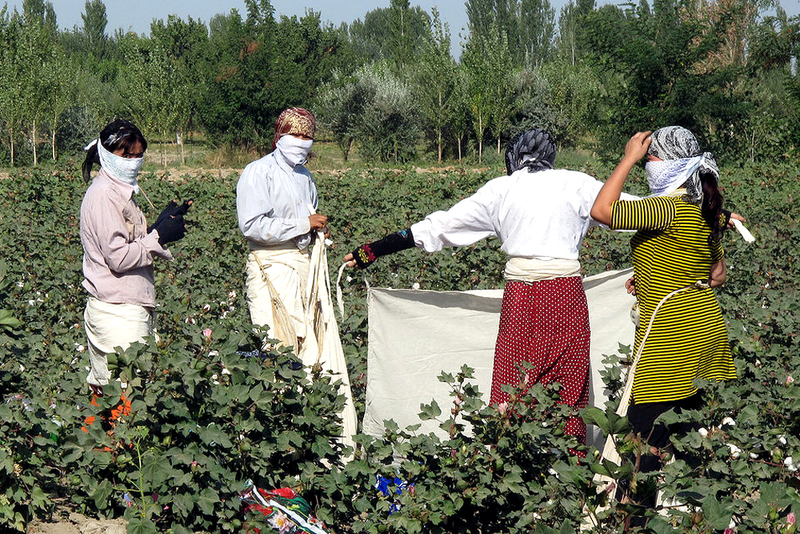 Uzbekistan’s government has traditionally characterized cotton-picking as hashar, a term for voluntary labor that Uzbeks are expected to undertake for the good of the community. In practice, the concept has provided a way for authorities to cast its use of forced labor in the best possible light. “If you refuse to work in the cotton fields, it is almost as if you are a traitor. … Everybody has to obey,” a schoolteacher in Uzbekistan told a human rights group this spring. Now it appears that Uzbek authorities are rethinking their use of forced labor, even mulling doing away with the practice altogether. But some experts say for that to happen, a total overhaul of the cotton sector is needed. Driving teachers, doctors and students out of hospitals, schools and universities and into the cotton fields had been standard practice throughout Uzbekistan’s 26 years of independence. So many were astonished in September, when Tashkent suddenly ordered them home mid-harvest. The government is presenting this as a prelude to the total abolition of forced agricultural labor that Uzbekistan – the world’s fifth-largest cotton exporter – has long relied upon. The recall of some forced laborers came weeks after the government issued a decree categorically banning the use of children, along with education and healthcare workers, in the harvest. And it was two days after President Shavkat Mirziyoyev admitted to the world at the United Nations General Assembly that forced labor exists in Uzbekistan. This year’s harvest season began like any other. In the spirit of hashar, the government enlisted celebrities like the singers Yulduz Usmonova and Shahzoda to help with the harvest. Photos on Instagram show the smiling stars romping among the cotton rows and enjoying a slap-up meal with fans. Tashkent’s change of heart appears motivated by the desire of Mirziyoyev, who has shown reforming zeal since coming to power last year, to improve Uzbekistan’s image in the eyes of the international investor community. The deployment of forced labor and child labor has over the years prompted major international retailers to boycott Uzbek cotton. Yet as Uzbekistan wins plaudits, rights campaigners are warning that the cotton must still be picked. So who is doing it? The burden is simply shifting to other forced laborers, Umida Niyazova, director of the Berlin-based Uzbek-German Forum for Human Rights, or UGF, told EurasiaNet.org. “Ultimately it turns out that when one population group – students – is freed from cotton picking, the burden falls on other population groups,” Niyazova said. The UGF continues to report multiple cases of forced labor and says some recalled pickers had to pay for replacements out of their own pockets, despite government warnings that this practice was to be proscribed. Nevertheless, there are signs that Tashkent has started to get serious about forced labor. “We’ve seen a significant shift this year,” said Jonas Astrup, chief technical advisor in Uzbekistan for the International Labor Organization (ILO), which is monitoring the harvest and working with the government to end forced labor. Tashkent is demonstrating “a genuine willingness” to address forced labor through reforms that are “ambitious yet realistic,” Astrup told EurasiaNet.org. The reform plan has two main pillars: mechanizing the harvest and increasing rates paid to cotton-pickers to attract more voluntary workers. Cotton-pickers are currently paid 700 sums (9 cents) per kilogram (800 in some regions) for the back-breaking work. That might sound like a pittance, but it is on a par with salaries in other unskilled sectors in Uzbekistan – and it is 146 percent more than what was being offered last year. The state-set purchase rate paid to farmers has also increased to 3.4 million sums ($420) per ton — a 56-percent increase on 2016. This is significant, since an ILO study has found that eliminating forced labor would be “entirely manageable” through changes to recruitment and employment practices. Around two-thirds of the 3.7 million people involved in Uzbekistan’s 2015 harvest were already voluntary, often rural women seeking an earnings boost, according to the research. The other third were “reluctant” (20 percent, perceiving “social pressure”) or “involuntary” (14 percent, picking cotton because of a “perceived risk” of dismissal, wage cuts and harassment; or their inability to pay for a replacement worker), the study noted. The study assessed that 1.7 million people would willingly pick cotton in the future without changes to conditions, that 1.2 million more would pick for better pay, and that 476,000 would do so given improved conditions in the cotton fields. In officials’ most optimistic view, mass labor will gradually be phased out. The government has set the goal of mechanizing 80 percent of the harvest by 2022. That is an ambitious target given that current levels are close to zero. And Tashkent has already missed a target declared by Mirziyoyev, when he was still only prime minister, to have up to 90 percent mechanized by 2016. Uzbekistan possesses only 1,000 of the 14,000-15,000 harvesters required, so it plans to ramp up output from this year’s 1,500 to 10,000 by 2019 – an eyebrow-raising 566-percent increase. In the Soviet era, Uzbekistan was awash with cotton harvesters. But mechanization still flopped, largely because central planning overrode realities on the ground, according to research by Professor Richard Pomfret of the University of Adelaide. Mechanization is usually driven by market economics, when rising wages make machine-harvesting cheaper. That is not the case in Uzbekistan. There will also be a trade-off in quality with the transition to mechanization, which reaps lower-quality cotton. Currently, 30 percent of cotton is machine-picked worldwide, and only in Australia, Israel and the United States is harvesting fully mechanized. A World Bank study has found that Uzbekistan’s cotton-pickers widely believed “mechanization will negatively impact their livelihood,” with women “particularly concerned”. It also found some farmers supporting mechanization, but others believing their cotton-growing land would be unsuitable. The World Bank supports Uzbekistan’s mechanization drive “as a way to improve the overall productivity of the cotton sector,” a representative for the bank told EurasiaNet.org. It is funding projects to adapt Uzbekistan’s cotton industry to mechanized harvesting, and diversify agriculture away from cotton by planting more fruit and vegetables – a government priority. The real answer to forced labor, say campaigners, is reforming the state cotton-sector monopoly, under which the government obliges farmers to grow at state-set quotas and sell at fixed prices. Tashkent accumulates the profits in a government fund “which lacks transparency and is only accountable to a narrow circle within the national leadership,” according to a report published by the Open Society Foundations. Uzbekistan may be taking “effective measures” to eradicate forced labor, as Mirziyoyev told the UN last month, but campaigners say the true test will be seen in the tangible results on the ground.